The mobile apps business is showing the promise of sustainability for makers who get users to not only download, but also actually use their applications. “The app economy is primed for long-term success,” according to industry watchers at App Annie, an “app economy” data startup whose slogan is “build a better app business.” The company reports that worldwide time spent in apps has more than doubled since 2014’s first quarter, that the iOS App Store leads in revenue, generating nearly double the revenue of Google Play, and that many of the fastest growing apps fulfill tasks that have traditionally been completed offline. 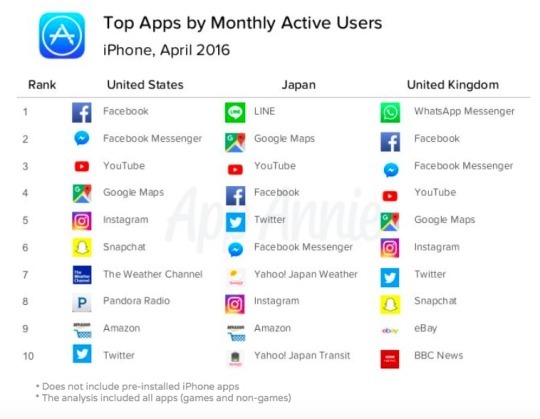 With Amazon ranked ninth in the US and Japan, and eBay ranked ninth in the UK, App Annie says retail and peer-to-peer commerce apps are proving that mobile has great potential for become shoppers’ first stop. See the full “Usage Is the New Currency” report at App Annie.